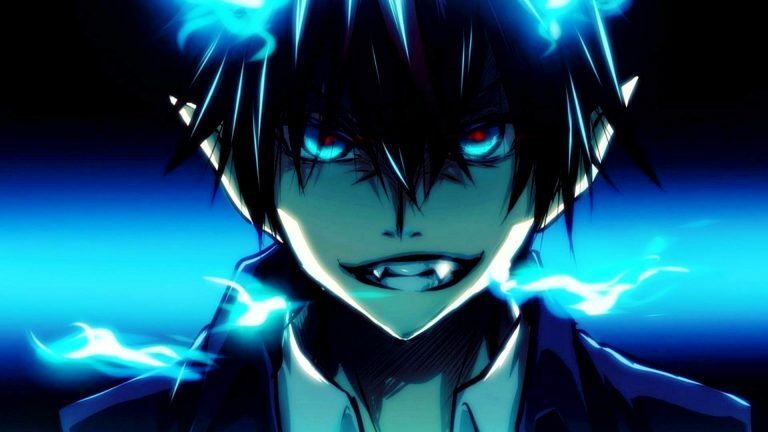 The story revolves around Rin Okumura, who, along with his younger twin Yukio Okumura, was raised by Father Shiro Fujimoto, an Exorcist. One day, Rin learns that he and Yukio are the sons of Satan. Witnessing Shiro dying to protect him, Rin draws the demon-slaying sword Kurikara (倶利伽羅), which restrains his demonic powers. From that moment on, Rin not only gains demonic features like fangs and a tail but also the power to ignite into blue flames that destroy almost anything they touch. Rin wishes to become an Exorcist like his guardian to become stronger and to defeat Satan. He enrolls at the prestigious True Cross Academy (正十字学園 Sei Jūji Gakuen), an exorcist cram school, which is actually the Japanese branch of the True Cross Order (正十字騎士團), an international organization dedicated to protecting Assiah (human realm) from the Gehenna (demonic realm). Much to his surprise, Rin finds that Yukio is already a veteran Exorcist and is one of his teachers. Thus begins Rin's journey to become an Exorcist, accompanied by his brother and his fellow students who quickly become his close friends. Blue Exorcist (Japanese: 青の祓魔師エクソシスト Hepburn: Ao no Ekusoshisuto) is a Japanese manga series written and illustrated by Kazue Katō. The series was adapted into an anime television series by A-1 Pictures in 2011. The plot of the anime contains anime-exclusive story arcs since the anime and the manga diverge significantly starting with episode 16 of the first anime season. The original ending contained within the first season’s final nine episodes is ignored in the second season, with the anime story timeline once again following the narrative of the manga. The story events which take place in the second season correspond to volumes 5 through 9 of the manga. When my younger-self watched Blue Exorcist seven years ago, I didn’t think much of it then. It was good enough for me to finish, but not quite memorable enough to recall the plot. Rewatching it now, I am liking it much more. It has subtle nuances that I think I may have missed the first time around, or maybe my maturity had changed. The animation is superb. The colors are vibrant but tend to be deeper and darker. Almost every scene has great detail and is beautifully drawn. The two opening themes this season are “Core Pride” by Uverworld and “In My World” by ROOKiEZ is PUNK’D. The standout first opening theme “Core Pride” is really catchy and totally match the anime vibe. The opening shows both it’s playful and somber side very well. The two ending themes are “Take Off” by 2PM and “Wired Life” by Meisa Kuroki. I like the second ending “Wired Life” with its rhythmic vibe. Unfortunately, the first season includes many filler episodes. They are episode 6, 11, 16-25. Episode 6 isn’t so bad but episode 11 really pulled me out of the series. It was boring, cliche, and should definitely be skipped. Episodes 16-25 deviated from the manga and in season two, they were ignored. It was quite noticeable in episode 16 and up that the writing is no longer consistent. A simple misunderstanding could be easily cleared up with a few sentences but each character just escalates things in order to fit the narrative. It was quite infuriating to watch. I highly recommend Blue Exorcist, minus the filler episodes. So I would say watch 1-5, 7-10, 12-15, then to season two if you want to follow the manga storyline. This anime contains graphic violence and mild suggestive theme/language. Intended for young adults.